Classy looking boat. Really nice color choices. Great job! Re: Another Prospector done and dunked. Well, after a year including much invaluable advice and feedback from you gentlemen, she had her first spin last weekend and she loved it. As I've read somewhere, she needs a little ballast to show her true colors, so I loaded her up with a son and grandson and she seemed to love it even more. Quite a while since I've paddled so the knees will have to get used to being under the thwart if I want to get down to some serious Bill Mason solo leaning. Very satisfied (and somewhat relieved) with the result. Added my own touches like the bronze painter fair leads and flush thwarts which I connected to the inner gunnels with lapped dovetail joints (would be more visible with lighter stock; ash or oak ). Had a query about building a 'mini' Prospector, about 12', for somebody after they saw my 16 footer. Haven't located any plans yet, so If anyone knows of a source I'd be grateful for the info. That is very nice Mark! A 12 foot Prospector? Never seen any plans for that. 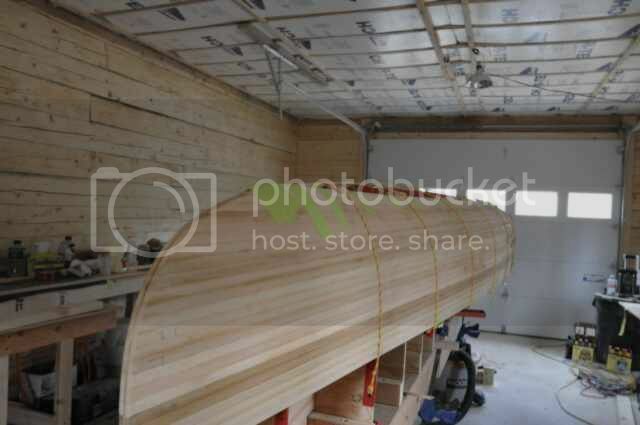 I know of plans for other 12 foot canoes if interested. Mark - very nice. Great work! Looks gorgeous, Mark. I love the dark trim. What did you use? Thanks. Your comments very much appreciated. The dark trim is Peruvian Walnut with integrated pin striping of basswood and WRC. Your friend wants a 12' prospector style canoe, but I think that is a bit extreme. 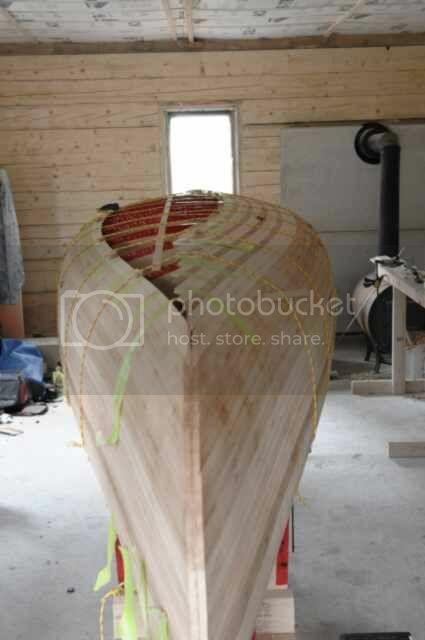 If its a canoe that you will sit on a high seat or or even kneel it is going to have to be 28" wide at least. It will lose all those nice prospector characteristic if you shorten it that much. There is a very nice Chestnut model about which there is much debate as to its history. The Chestnut Fox. This is a solo canoe 14' long and 30" wide. A real gem, in my opinion, in the prospector style. 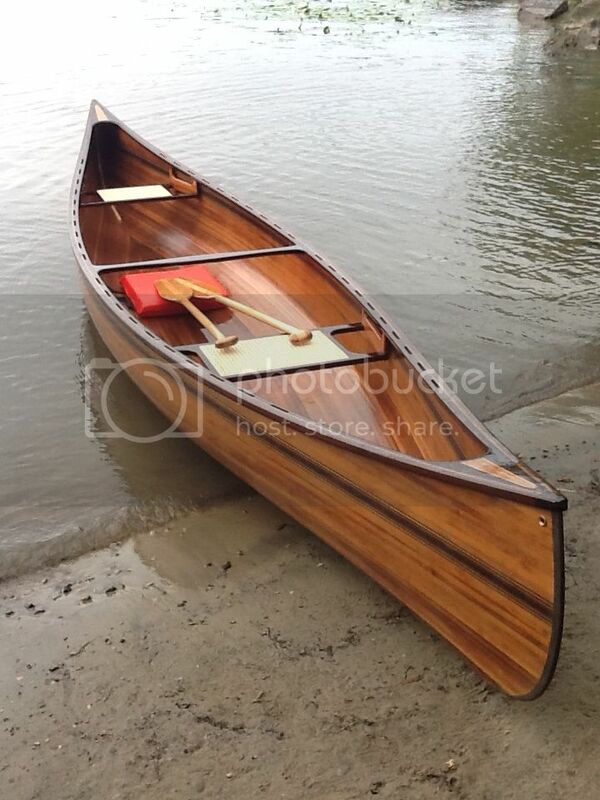 This would be a canoe that I would take on a 7-10 day trip. Its built in wood/canvas by Doug Ingram at Red River Canoe and Paddle. He also has a dedicated freestyle canoe, Esprit, that is 13' X 28". Years ago he sold the patterns for the Fox wood/canvas mold, which takes quite a bit of careful redrawing to use for strip building. I am not sure if he still sells these plans, though. Reducing a Prospector from 16' to 12' proportionately doesn't make much sense agreed, but the Chemaunis 12' from Carrying Place in Kleinberg Ontario has enough of the Prospector 'look' for the possible project. They also provide plans for a 14' stripper which, for a smaller, albeit beamy, version of the standard Prospector, would be a possible contender. Red River's forte is Cedar/Canvas. Couldn't find any reference for stripper plans. I have been planning and scheming to build this boat for a couple years now, and I am finally doing it. I'll try to remember to post photos and other updates as I go. I am about 2 months in and feel like I am making good progress given the other things on my plate. Here is another photo showing the side a bit better. The canoe is actually a bit further along than this, but I have not taken photos lately. I guess this will be motivation to take more photos. Any Corrections from '97 vintage Canoecraft.? I've about finished drawing up my station forms for the Chestnut Prospector, using the '97 printing of CanoeCraft. I've read many of the past posts on the Prospector and have seen no mention of any corrections, but, I don't know which book they were building from. I've read where there were corrections for some other boats but, don't know where to look for them. So, my question is: Are/were there any corrections in the numbers for the Prospector station molds.? If so, where do I find them.? I've drawn them in light pencil and I'll be inking them if they are all correct. Appreciate the help. Doesn't appear to be anything listed for the Prospector, so I'm good to go. I did find a small glitch in the stem figures, but, it's less than 1/16" and I'm guessing it's because this graph paper is very slightly off. I just moved it to where it's lined up and DONE.! What has happened to all the builders that used to post here? They all out paddling and nobody is building any more.? The Guillemot Kayak forum is equally slow. Everyone been out paddling for the past 4 or 5 years..? Should have a new generation of builders starting up soon. Been trying to get my Kids and G-Kids interested for years with very little luck. Maybe when I get this Prospector finished I can get them fired up to help build or do their own. I have 3 under my belt, fortunately (or unfortunately) the family has decided that if I can do canoes there are lots of regular wood working projects that I could also do ... it's hard to turn down requests. I have planned for another build in the spring, so that is at least one more in the future, lol. Just about done with my drawings of Prospector sta. molds. On #7, I'm seeing it split in two and attached to both sides of the stem mold. I believe I'll be using 1/2" birch ply for the station molds and 3/4" for the stems, just for more support for the inner stems. So, as I understand it, I need to split my #7 station mold in half and subtract 3/8" from the inside of each. Don't know if it's more or less work, but I'm thinking of doing a half-lap type joint where I cut a 1/2" slot up from the bottom of the stem mold, the width of the of the station mold and an opposite 3/4" slot down from the top of the station mold, 1/2 the length, and slide them together. If the joint is kept snug, it would align everything just fine. If not snug, then a 3/4" square cleat would then hold them in place. Anyway, something to think about while it's raining out.